Pre-race scenes from Brushy Mountain State Penitentiary at the 2017 Barkley Marathons. A view of Brushy Mountain State Penitentiary. Inside Brushy Mountain State Penitentiary. One of this year's books is entitled "There's Nothing Wrong with You." Lazarus used to go get books from the used shop, but now people actually send him ones with fitting titles. Toilet in the guard tower, where one year the race director hid a book. Mural inside Brushy Mountain State Penitentiary. Under the chapel is "the hole" where inmates would be sent to solitary. Brushy Mountain State Penitentiary. Photo: Michael Doyle / Canadian Running Magazine. A part of the course features road running. Canadian Running toured Brushy Mountain State Penitentiary on Friday morning ahead of the Barkley Marathons. 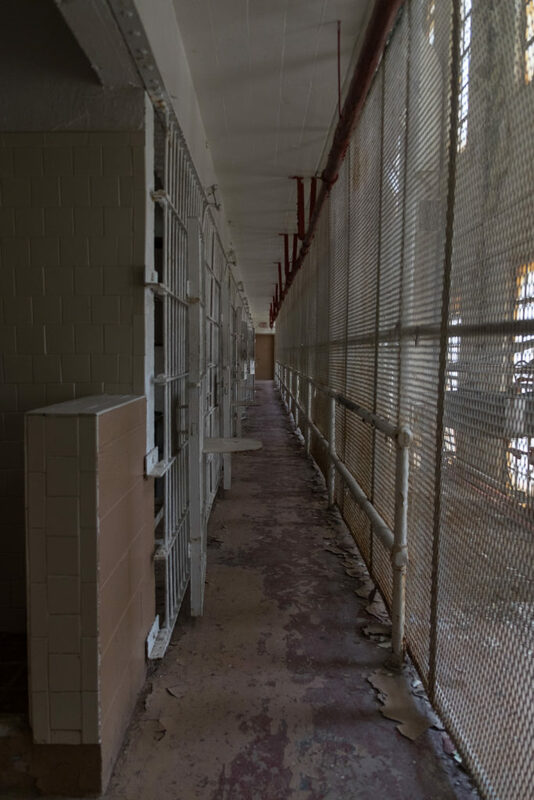 The former maximum-security prison is part of the ultramarathon’s course and famously housed James Earl Ray, whose escape from the prison and subsequent capture was, in part, the motivation behind beginning Barkley. The penitentiary is located in Petros, Tenn. in Frozen Head State Park. RELATED: How to follow the 2017 Barkley Marathons. During the Barkley Marathons, which begins during a 12-hour period between 11 p.m. March 31 and 11 a.m. April 1, with a conch signalling one-hour to the start, runners run below the prison through a drainage pipe. Gary Robbins is the most notable Canadian entrant and he looks to become the 15th finisher of the 100-plus-mile trail race in the event’s 30-year-history. Rather than having timing chips, race director Lazarus Lake ensures runners complete the necessary distance by having participants collect pages of books scattered along the course. The book at the prison for 2017 is entitled There Is Nothing Wrong with You: Going Beyond Self-Hate though its location remains a secret.